The Premier Party Canopy Tent is constructed to meet the highest standards. 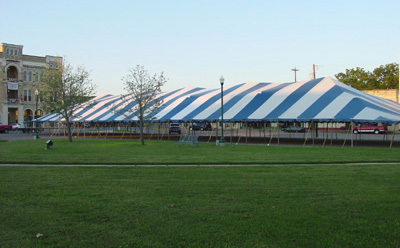 With its 70 feet by 250 feet coverage area, the tent has been built to withstand 70 mile winds when properly installed. Choose your favorite color from white or striped on the heavy duty 15 oz black out top tent. The kit also includes 16 gauge steel poles that are strong, durable and easy to use. The materials for the tent all fits into the two storage bags. This tent is built to be a semi-permanent structure or to be set up and taken down many times.